AUTHOR INFORMATION: John A. Pitts is a BA in English and a Masters of Library Science from University of Kentucky. He is also a graduate of the Oregon Coast Writers Workshops with Kristine Kathryn Rusch and Dean Wesley Smith. He also loves practicing martial arts. He has previously published short stories in magazines such as Fortean Bureau, Talebones magazine and a couple of DAW anthologies as well. PLOT SUMMARY: Sarah Beauhall has more on her plate than most adults in their twenties: day job as a blacksmith, night job as a props manager for a low-budget movie, and her free time is spent fighting in a medieval re-enactment group. When the lead actor breaks Sarah’s favorite one-of-a-kind sword, it sends the director into fits. Sarah agrees to repair the blade to avoid reshooting previously filmed scenes. One of the extras claims to be a dwarf and offers to help her at the forge. That’s when things start to get weird. Could the sword really be magic, as he claims? Why does he want her to kill a Portland investment banker? And what is it about that homeless guy that has her on edge? As if things weren’t surreal enough at that point, Sarah’s girlfriend Katie breaks out the dreaded phrase… “I love you.” Black Blade Blues is about forging an existence in a world that is much different than one expects. Oh, and there are dragons too! FORMAT/INFO: Black Blade Blues is 397 pages long divided into Seventy-five chapters. It marries Norse mythology with the contemporary settings. Narration is in the first person for Sarah Beauhall. This book has a self-contained plot line, but is the first book in a new series which has been contracted for a total of three books. 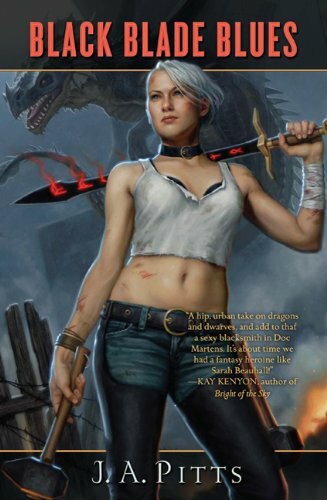 April 27, 2010 marks the North American Hardcover publication of Black Blade Blues via Tor. OVERVIEW/ANALYSIS: Black Blade Blues is the debut novel of John Pitts, it features a world where Norse mythology has come alive in the Seattle area. Sarah Beauhall is the main protagonist of the story and is an amateur blacksmith who’s trying to earn extra money by serving as a prop manager for various movies. As prop manager her creations get a chance to be featured in the movies. Sarah has an interesting life; she’s from a small town and is into medieval warfare role play and heavy metal. She's also in love with Katie but appears to be in a bit of denial over it. The story begins when J.J. the main actor breaks an ebony blade and Sarah has to re-forge it for the shooting requirements. This small act begins a new chapter in her life and also kicks off this story. She meets Rolph an extra on the set who share more than a passing interest in Sarah’s smithy skills and the ebony blade which she re-forges. He informs her about its Nordic origins and how the re-forging heralds her as a warrior. Katie begins to hint that maybe he is really a dwarf from legends. John Pitts has created a fascinating character in Sarah. The use of the first person point of view gives readers a more intimate look into Sarah's thoughts which help gain a clearer understanding of the story and settings. However this form of writing also served as a double edged sword because it didn't really endure me to the character of Sarah. The reason being is while I could understand Sarah's struggles and find them admirable, as a person I found her to be a bit immature. The writing is clear and gives us a fair view of the world and characters that inhabit it. The story is not something entirely new and has been done before, the twist here being that the main character is a woman blacksmith and a lesbian with identity issues.The pacing slows down when Pitt shows us Sarah's troubles and the ending is a bit drawn out. Although the ending is drawn out it does contain a slight twist that might spruce up the reading for veteran readers. There is complete plot resolution by the end of this book and the stage is set for the further (mis)adventures of Sarah. This book was a highly anticipated book for myself and it could be that this played with my experience of this book. My expectations might have been a bit to high for what was essentially delivered. Black Blade Blues is a good debut but does have some plotting issues, which I hope the author can overcome. I'd recommend this book to those urban fantasy fans that are looking for a different kind of protagonist. Overall a good debut which promises to bring a nice read involving questions of life, identity and love with a bit of off kilter sense of humor. I have this in pre-order, and really looking forward to it. I think you might like this, in lieu of your Urban Fantasy thread on SFFworld, this definitely is a good debut to try. Do let me know how did you find it? Will do, will probably start a thread on it once I start reading it. Still waiting for the book to arrive, hopefully within the next few days. I was going to pm you last week wondering if you had plans on reading this (before I had decided to pre-order it), since I know that around here you're pretty much the one always checking out these kind of books. So I was pleased to see this review a couple of days later. Going by your review I think I will surely enjoy it since things you seem to have issues with I don't think I'll have a problem with, and as you clarify in some instances it also seems like some of the issues had more to do with your experience as a reader rather than a weakness in the book itself. The book is definitely a good one in the sense that even thought the setting is pretty much what we have read about previously, the characters and writing makes it fresh. The major niggle for me was the plotting part as in the middle and in between the climax, the book drags a bit however ends on a nice note & yeah I guess sometimes anticipation can hamper one's read. Hopefully in the next 2 books [HONEYED WORDS,HEARTH AND HOME] these issues might be resolved by the author. Well I read this a couple of weeks ago, and really liked it. You were spot on in your review though, I could certainly see where your complaints, critiques, and observations came from. Reading around it seems like this will be a trilogy, at least he has a 3 book deal at the moment. The sequels will be Honeyed Words for 2011 and Hearth and Home for 2012.
this book is so interesting but how i can understand this book fastly as the days drag by because i choose this one as my book report in my english subject. The simplest way would be to read it. I'm not sure though as to why you chose this for a book report and is it allowed in the school curriculum?